Digitally Powered PR | A PR pro's chronicle of how digital technology is transforming communications. Eric Mower + Associates is proud to be announcing today that Centscere is the 2014 winner of the Market Ready Award. Centscere is the start-up company that lets social media users turn tweets and likes in to donations to causes they care about. Like our first Market Ready winner, Rosie, Centscere is just the kind of company we had in mind two years ago when we created the Market Ready Award as part of StartUp Labs Syracuse. It’s a breakthrough idea that’s far along in development. It’s been created by people who are open to innovative marketing ideas. How can we not be excited? Centscere breaks the mold for charitable giving. It’s an entirely different way of making a donation – a digital version of collecting small change outside of a retail store. But instead of charities chasing down donors with their hands out, caring people can select the causes they care about. And then every time the donor does something he or she enjoys – engaging in social connections – they make a micro donation. Centscere makes it easy for non-profits to connect with donors in new ways. For most charities, implementing digital fund-raising channels is either daunting or impossible. They don’t have the knowledge, technical expertise or experience to build it themselves. And many platforms that enable digital transactions can have high base fees. Centscere eliminates those barriers. As the platform launches, there is no cost for charities to become Centscere partners. And for signing on, they get access to a fully built, tested and secure platform for online giving. Centscere gets a small share of the money donated. And, of course, non-profits need to do their own work of promoting the Centscere channel, but that’s a requirement in any fundraising model. It couldn’t be easier. And most important, Centscere turns social in to something good. People of all ages spend hours of every day on social media and most of that time can feel like it is wasted. But not when every post triggers a small donation to a good cause. Centscere lines up perfectly with purpose-driven Millennials who passionately want their activities to contribute to a better world. So instead of being made to feel guilty about engaging in social media, now users can feel good about tweets and comments. And given how much social is woven through every aspect of our lives today – news, entertainment, shopping, and even friendships – why not make it a part of the way in which we give? The small individual contributions that Centscere creates won’t meet the full fundraising requirements of non-profits today. As the platform grows in scale, however, don’t underestimate its potential to generate significant dollars. And for charitable organizations trying to engage with the next generation of donors they will rely on in the future, Centscere is an appropriate and natural way to build relationships and start a habit of giving that will create even bigger returns in the future. That’s good for Centscere. And the whole world, too. Among top advertising and marketing luminaries on the opening day of the 4As Transformation conference in Los Angeles, I think the chief operating officer of a drug store chain best summarized the key challenges most marketers face with digital technologies. Ken Martindale leads Rite Aid, the 4,600 store pharmacy chain. According to Martindale, “the change that is occurring in our channel is unprecedented.” Gone are the days of “just putting pills in a bottle,” Rite Aid now lives its brand position of “stay healthy” by providing immunizations, offering health care coaches and partnering with physicians practices. Changing customer expectations and competitive pressures are forcing Rite Aid to reinvent its business. So even if you don’t run a drug store, you’ve got something in common with Ken Martindale. Martindale said the second major technology challenge for marketing is measurement. Rite Aid can now quickly assess whether a program is working. If it works, Martindale says marketers need to be able to “put the gas down.” If it’s not, it’s time to stop and reassess. The right diagnostics enable real time course correction to ensure programs deliver maximum results. Virtually every client Eric Mower + Associates is working with is grappling with the new opportunities and challenges that technology present. Martindale’s diagnosis on Rite Aid’s marketing situation helps keep my focus on two of the most important issues – data and measurement. Even If the Truth Hurts, Share Bad News with Employees. Rule #3: If you don’t share bad news candidly to the same degree you trumpet good news, kiss your credibility good-bye. It’s hard to imagine a more crushing message to your own employees than allowing them to find out about negative developments involving their organization in the morning newspaper or from a competitor’s email… before management has bothered to tell them. The most damning indicator of an ineffective or failed employee communications function happens when employees learn first about something important from any other source. That goes double for bad news. If you want to insult your most important productive asset with “you can’t handle the truth,” regress back to the Mushroom Strategy. Shut off the flow of information just when it’s most needed and demanded. 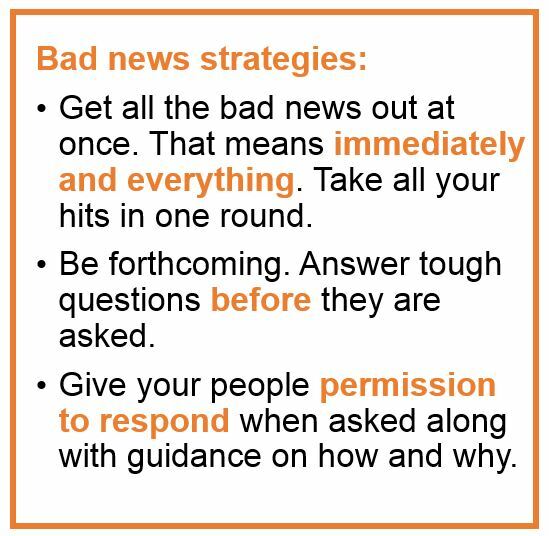 When addressing negative developments, organizations get only one chance to avoid appearing defensive or prevent being tarnished with implied guilt. That one chance occurs before any other party reveals it. So, if you know that bad news is going to come out anyway, tell your own people first. In doing so, you will effectively release it proactively and preemptively, which can also be an important signal to the news media and public that you are not hiding. Remember, in our culture, no comment implies “guilty as charged”. Take all your hits in one round. Get all the bad news out at once. You’ll appear forthcoming while tamping down damaging rumors and speculation. And admit it if bad decisions or mistakes were made. People will view you favorably as a “stand-up” organization. Yes, this is tough advice to take. Management’s commitment to candor and transparently will be severely tested. Nobody likes to deliver bad news, especially when it’s embarrassing and reflects negatively on their competence. But the alternative is far worse. The best way to answer tough questions is to answer them before they’re asked. So address anything you think reasonable people will wonder about. You’ll actually enhance your own credibility if you do. And yes, if the news is bad, important, potentially controversial or explosive, it will be leaked to the media and/or posted on-line nearly instantaneously. See Rule #1. Yes, it applies to unpleasant news just as it does to happy. But this is not a bad thing. Remember how critical employees are in today’s social world. Having your own ambassadors become messengers for the company’s side of the story (faster and more persuasive than the news media) is the best guarantee that your information regarding the negative developments will be incorporated accurately with greater balance in the discussions and coverage that follow. In a previous post, I posited that two-way communications define the new normal. But it bears repeating: today, consumers and stakeholders expect and often demand that companies and organizations interact by talking with, not talking at each other. So who’s going to do all this interacting? Rule #2: If you want your employees to be company or brand ambassadors, you must give them plenty of content to work with… and permission to use it. There’s a growing body of research evidence indicating that employees – not executives nor designated “official” spokesmen nor celebrity endorsers – make the most credible and influential advocates for any organization. Word-of-mouth interchanges taking place everywhere online create a natural arena for ordinary employees to participate in discussions about the organizations they work for. And why shouldn’t they? Who knows better how their products are made ? Why they’re made the way they are? Why they’re better? If the organization is doing important work that benefits society? If the company really is environmentally responsible? And by the way, what it’s really like to work there? Are the company’s future prospects bright? Against this backdrop, any enterprise still trying to enforce sweeping policies prohibiting employees’ talking with the outside world is hopelessly out of sync with reality. Not only are such gag orders destined to fail, they can backfire should the organization be suspected of manipulating or worse, covering up the truth. It is a far better situation to have fully informed employees who appreciate the trust placed in them empowered to talk proudly about their organization every chance they get. Thoughtful employees easily recognize that it’s in their own best interest to advance and protect their company’s reputation, along with winning fans and new customers by cross-selling products or services. All they need are the facts, along with guidance on how to share them if they choose to. Today, the best operating model for employee communications is that of a true news source that supplies a constant stream of information about the trends, developments, decisions, activities and impacts occurring in every corner of the enterprise. The more diverse, multi-dimensional and far-flung the company, the more expansive this internal news coverage must be. Employees are just as unschooled in areas or functions outside their own as anyone. Universal e-mail news digests or internal network home pages appearing at every logon make the job easy. Nobody wants to work for an organization with a poor reputation. Right-minded employees want to be sincerely proud of their jobs, basking in company success and their role in it. It’s wholly counterproductive to deny any employee knowledge of what their organization is doing, along with the when, where, how and why. Equally important, they should be given permission to share this news, with guidance on how, when and where to use this information as part of every news item. Organizations following this strategy greatly multiply their influence by equipping and deploying a veritable army of committed, passionate ambassadors. A brief interruption to my series on the importance of Employee Communications for this report from the Content Marketing World conference. Randall Lane’s “mini-keynote” Tuesday at Content Marketing World 2013 had a curiously complex title: “The New Urgency of Putting Content Marketing through a Consumer Prism.” In the world of content marketing, where subjects project a distinctly different tone…Five Rules You Can’t Forget…12 Must Know Rules…How to Rock Your Content…the Forbes editor’s title was an outlier. One, editors think about their audience. What are their interests, preferences, needs and wants? In seminars earlier in the day, virtually every presenter emphasized the importance of creating buyer profiles and personas as the foundation of any effective content marketing program. Two, using their knowledge and understanding of their readers and viewers, editors practice good storytelling. They identify and report on relevant, timely stories that matter to their audience. In content marketing, we follow the same approach generating topics we think will engage buyers. We track them on editorial calendars that aren’t too far off the newsroom lineups I used as a radio assignment editor. And three, Lane said, editors package their content in formats and styles that are appealing to the user. Content marketers might take a premium white paper and repurpose (or package) it as an infographic, a meme and a video. 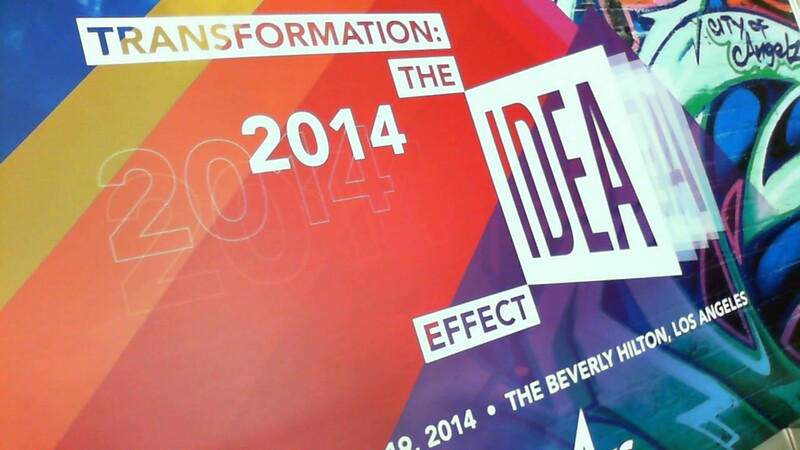 With his editor hat squarely on, Lane urged attendees to be transparent about their brands’ roles in their content. Fading are the days of “advertorials” that seek to blend in with editorial carrying only a mice type notice about its true form. Good branded content focuses on the user’s needs and interests – not the brand or its products. But transparent content is clear about who the creators are and their connections to the brand. Forbes does it well, incidentally, at BrandVoice. Makes the old newsman in me smile. In my previous post, I promised to provide some guidelines to rethink the way internal communications work into today’s world. The “Mushroom Strategy” – “Treat employees like mushrooms… Keep ‘em in the dark and feed ‘em guano.” – no longer applies in today’s interactive environment. Instead, I believe there are enormous business benefits and opportunities just waiting to be unlocked by doing things differently. 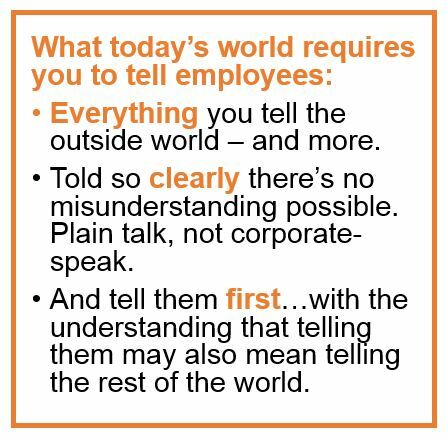 Rule #1: Today, all employee communications are public statements. Don’t kid yourself. A single mouse click on the “Forward” button is all it takes for one employee to spread any internal message to the outside world. This is not a new phenomenon. Nearly ten years ago, while assisting a company manage sensitive issues surrounding the closing of a manufacturing plant, we cautioned the CEO about sharing his plans via e-mail with his frontline management team. “I trust them completely,” he said. The announcement was scheduled for the next afternoon. Nevertheless, at 6:00 a.m., the company’s hometown paper hit the newsstands containing the full story, making an embarrassed management look foolish as it scrambled to apologize and explain to local and state government officials why they hadn’t called them first… and their own stunned workforce who learned they lost their jobs from the news instead of their own management. The only difference between ten years ago and today is that the leaked email would instantly be all over Twitter, FaceBook, and LinkedIn and in blogs, search results and news alerts everywhere. When employees are told something different from what you’re saying to the outside world, a dismayed, demotivated (and possibly angry) workforce resentful of the contradiction may result. Similarly, if (more likely when) the news media and public learn of the apparent disconnect, it could very well trigger a full-blown crisis if it appears to be deliberate obfuscation. If you’re not telling them clearly misunderstandings can cause similar trouble. That’s a big risk, because too many organizations today still regard internal communications as a low-priority activity. If “That’s HR’s job!” summarizes how your company manages internal communications, it’s time for a re-think. And if you’re not telling your own people first, you’re squandering whatever trust your workforce (your most important productive asset) places in their leadership and its credibility. This loss affects the very core of their motivation, loyalty and productivity. How’s that Mushroom Strategy working for you now? Occasionally, there are occurrences in the world that create unimaginable sadness. Such an event has happened today in Connecticut. In your work with clients, particularly in social media, please remember that people expect brands to be respectful when tragedy occurs. Frivolous, lighthearted or humorous approaches are insensitive at such a time. This is especially true regarding prescheduled posts which should be rescreened for appropriateness. It is a sad day. Be sure to assess client messaging in the context of the news of the day. My thoughts and prayers are with all of those affected by this horrible tragedy. My colleague, Steve Bell, was right in his Sunday, Nov. 4 blog post about the late decision to cancel the New York City Marathon. New York Times coverage on Wednesday shows how the organizers of the marathon are still suffering from their decision-making. Steve’s point of view is well worth reblogging here. 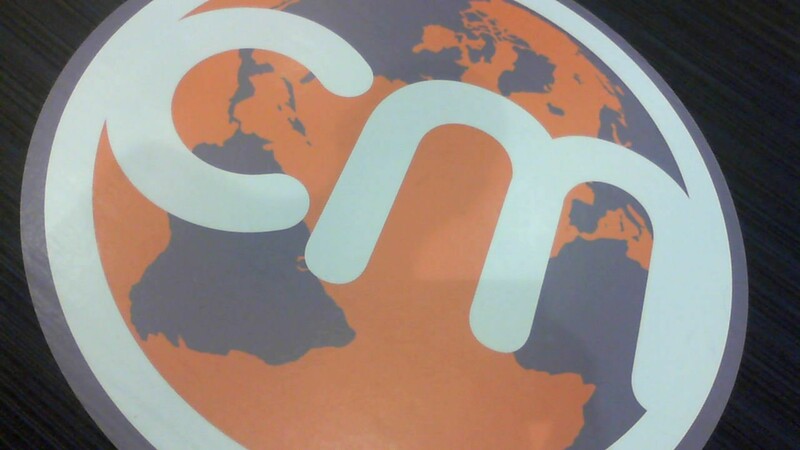 Read more of Steve’s thoughts on crisis management in the digital age at http://www.SteveonCrisis.Wordpress.com. We’ve written here in the last week about the deserved kudos for the quality leadership of the Northeast’s elected leaders, especially those in the New family, York and Jersey. Among the best was New York City Mike Bloomberg, who also managed to leverage a presidential endorsement into his dire warnings of storm damage. But Bloomberg, who is first and always a capitalist, let the promised millions derived from the New York City Marathon muddle his values — and his crisis management chops. The marathon should have been cancelled Wednesday or Thursday, at the latest. Was there any doubt after the attacks of 9/11 that the NFL would cancel that Sunday’s and Monday’s games out of respect? Recovery reports from Superstorm Sandy are heartbreaking. On Friday, as neighbors cleared properties that were battered by flooding on Staten Island, the bodies of two more storm victims were recovered in a home nearby. Like most who were spared the ravages of Sandy, my thoughts and prayers continue to be drawn to the thousands of people still suffering along the Atlantic Coast. The recovery is revealing important learnings about emergency communications in the digital age. Major shifts in how people are accessing news and information means crisis plans need to be rethought. Most public safety agencies and emergency planners have long advised citizens to tune to radio and television for the most current advisories before, during and after the storm. As with so many other things in the digital age, fewer and fewer people are turning there for news and information. An Adweek Data Points last month showed that while television is still the leading source of news for Americans, 39% of the people who were asked, “Where did you get the news yesterday?,” responded desktop and mobile devices versus 33% for radio. At Eric Mower + Associates, preparations for Sandy gave us the opportunity to test our new emergency communications system. During the past year, the agency completed a comprehensive update of the our emergency plan, including the creation of a new employee notification system called EMAlert. We could no longer accept the risk that an emergency situation that cripples our information technology system could also cut off communications to our staff. We worked with a world-leading provider of interactive and mass notification systems to ensure that the agency can now quickly and easily reach EMA people wherever they are with email, text and traditional phone messages. With a secure, offsite technology partner, we have greater assurance that we can help ensure the safety of our people and continue business operations in almost any type of emergency. EMAlert worked exactly as intended in our tests on the day Sandy arrived in the Northeast. Update crisis plans to address the reliance on mobile communications. Based on the size and scope of your organization, establish the right approaches (with built-in redundancies) to get messages to key stakeholders on mobile devices. 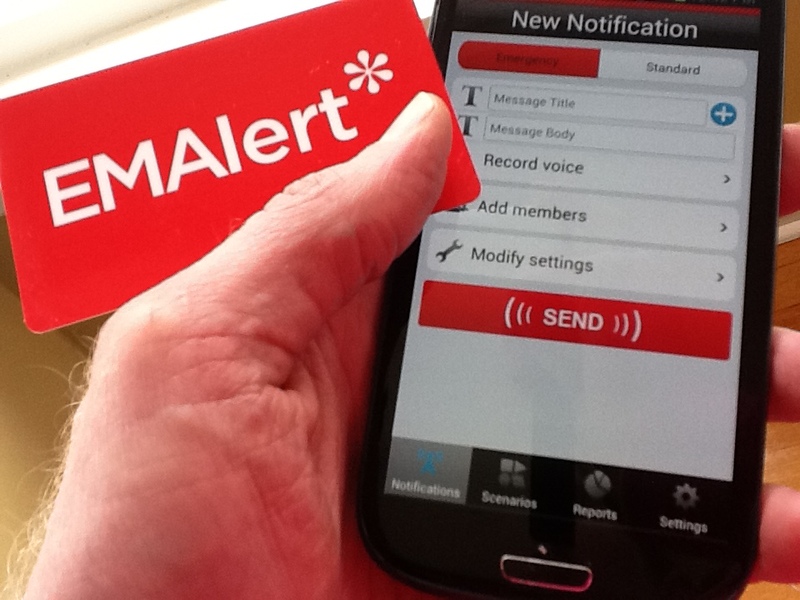 For EMA, it’s a third-party mass notification system. For your organization, it may be a simple “text-tree” supported by Twitter and Facebook messages. Closely monitor social media to debunk rumors and false information. Sandy brought many despicable examples of bad actors carelessly or deliberately sharing falsehoods during and after the storm. As exemplified by the good work of BuzzFeed’s Jack Steuf, though, it does appear that the social world can successfully “out” falsehoods and their perpetrators fairly quickly. Superstorm Sandy shows us emergency plans that advise having battery operated radios and extra batteries on hand aren’t ready for the digital age. And with the near certainty that virtually every business will someday face a major disruption, now is the time to upgrade your preparedness.